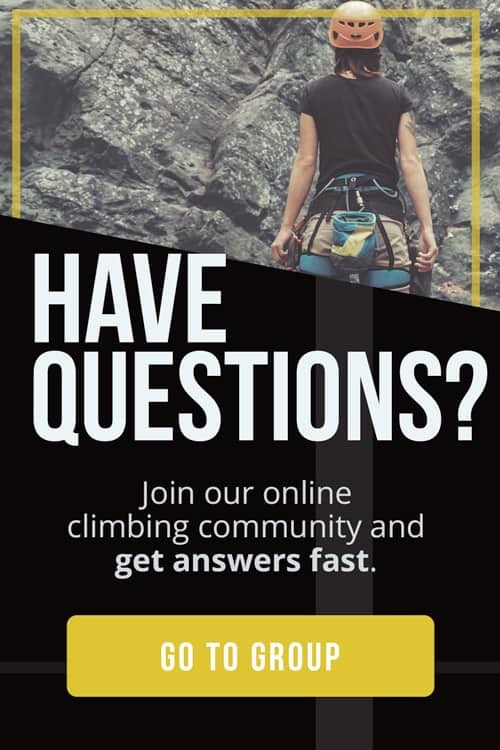 WHAT IS A SPORT CLIMB? So you’re hooked on sport climbing and love the feeling of flying up bolted faces on immaculate rock. But the top of sport climbing routes can be confusing, and making a mistake can be fatal. 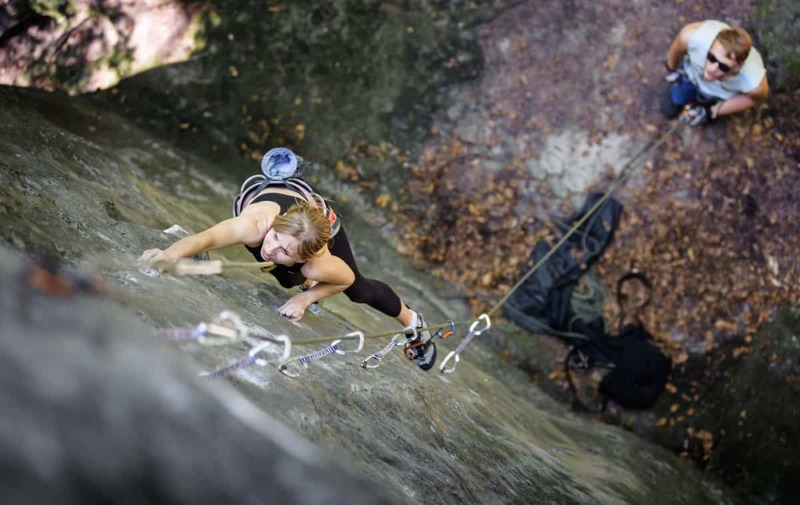 How do you set up the right sport climbing anchors for a safe top-rope? And, how do you clean the gear off the anchor afterwards? You often have to be comfortable untying the rope from your harness in order to clean sport climbs – a daunting, even terrifying, prospect. One of our big goals here at The Adventure Junkies is to turn the complicated, and potentially dangerous, into a task much safer and easier. 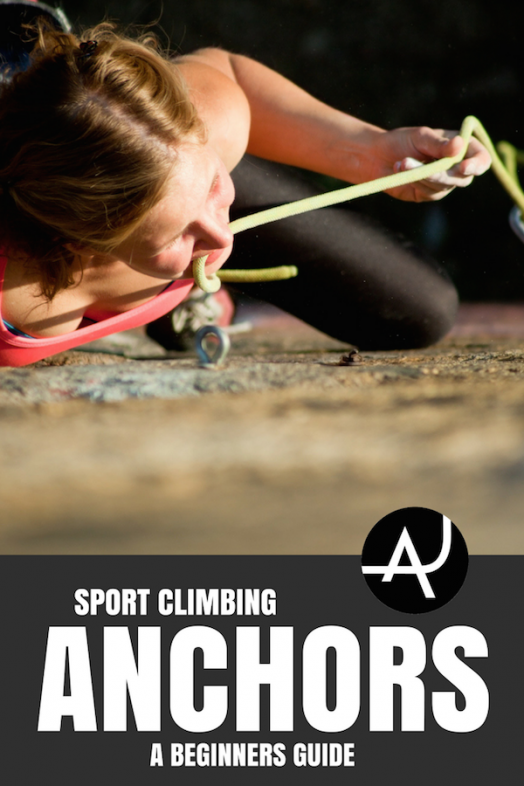 In this post, we will walk you through setting up and taking down sport climbing anchors. A sport climb is a bolted rock route, where a series of safety bolts are drilled into the rock every few meters. As you climb up, you use a quickdraw to attach the rope to each bolt, clipping the top carabiner into the bolt, and the rope through the lower carabiner. This is what will catch you in the event of a fall. At the top of every sport climb is an anchor. It is almost always two points of safety, whether it be two bolts, or two chains hanging from bolts, or two rings attached to bolts in the rock. Once the rope is safely clipped through opposing quickdraws on the anchor, the belayer can safely lower you to the ground. The route is now equipped for other climbers to enjoy, with a quickdraw on every bolt, and two at the anchor. 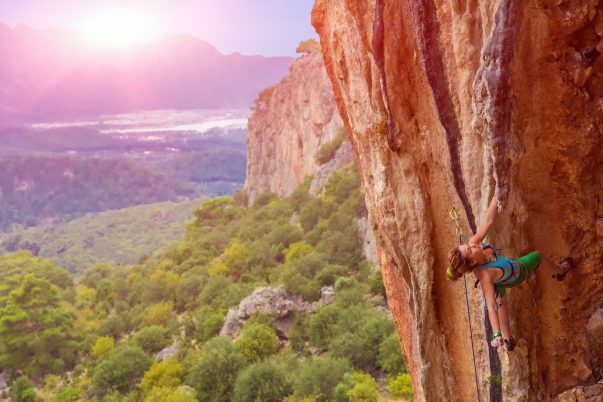 Top-rope climbing is one of the safest forms of climbing, where the rope runs from the belayer to the anchor at the top of the route, and then back down to the climber. If the climber falls, a tight belay means that the fall will be kept to a minimum – often only a small amount of rope stretch. There are several ways to set up a top-rope anchor but never thread the rope directly through the chains or rings on the anchor points for top-roping. This is considered poor practice as it will wear down the anchor points and eventually render them unsafe to use. The easiest top-rope anchor is to have the rope run through the lower carabiners of opposing quickdraws that are clipped to each of the two anchor points. This is the set-up that climbers usually establish once they get to the top of a route. While opposing quickdraws are commonly used and perfectly safe, you can also set up an anchor system that is equalized, meaning that the weight of the climber is evenly distributed on both anchor points. You’ll need a double-length sling/runner or cordelette, and four carabiners. Clip a carabiner onto each of the two anchor points and clip the sling through both carabiners. Grab all four strands of the sling and pull them down towards the direction of where the climber is. This means that if the climber falls, the master point will be in the best place to absorb the force of the fall on both anchor points. The sling should now be in a ‘V’ shape. Now you’re ready to create a master point. There are two easy ways to do this. Take one side of the sling and flip it once to create a sliding-x. Clip your remaining two carabiners through the sliding-x and then clip the rope through both carabiners. Make sure the carabiners are facing opposite directions. The advantage of this method is that the master point self-equalises, regardless of the direction of pull on the anchor. The disadvantage is, in the unlikely event of an anchor point failing, the sling will lengthen and shock-load the other anchor point. See this video on how to build a sliding-x. Tie all four strands of the sling together in an overhand knot or a figure 8 knot on a bight. This pre-equalizes the anchor and makes each anchor point independent of the other. Clip your two remaining carabiners, facing opposite directions, into the bight, and then clip the rope into the carabiners. While the master point may not always be perfectly equalized as the climber moves around, it will still be mostly equalized. The big advantage of a pre-equalized anchor is that if one anchor point fails for some reason, the other will not be shock-loaded. See this video on how to build a pre-equalized anchor. When building a top-rope anchor, you want to avoid any potential hazards. Make sure the sling or the rope doesn’t run over a rough, sharp edge, which could damage or even cut the sling or the rope. You also want the carabiners to hang cleanly. If a carabiner is running over an edge, then a fall could bend the carabiner and compromise strength, potentially causing it to snap. Check that the anchor bolts are tight, and if not, tighten them. Check your carabiners for sharp edges that could cut the rope. Make sure all hardware – bolts, chains, carabiners – is relatively free of rust and is not too worn; sometimes the metal can be almost entirely worn through. It is not unsafe to use non-locking carabiners but is safer to use locking ones. If you’re using locking carabiners, make sure they are all locked. 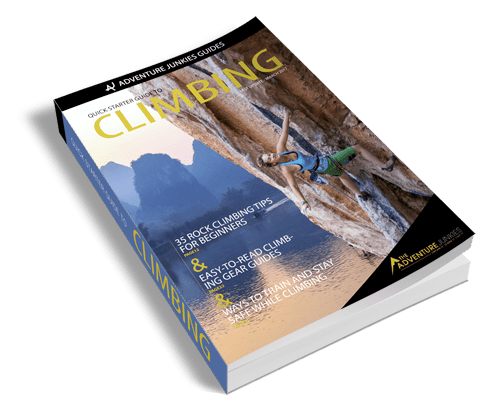 There are several methods to clean the anchor of a sport climb, but this post is going to outline the most common. When you get to the top of a sport climb and want to clean the quickdraws or the master point, the first thing you have to do is secure yourself into the anchor. There are a number of ways to do this, but they all involve using a sling, quickdraws, or a Personal Anchor System (PAS) to clip from the waist and leg loops of your harness to the anchor. Make sure to be always backed up. Use two locking carabiners to clip a different loop of your PAS to each anchor point. Test your PAS by calling “SLACK” to your belayer and putting your weight on the PAS, making sure that it comes tight. Once you are secured into the anchor, call “SECURE” to your belayer to indicate that you are safely attached to the anchor and ready to clean the gear. You now need to rethread the rope through the anchor points. Before untying the rope from your harness, you may want to secure the rope so that you don’t accidentally drop it, which would leave you at the top of a climb with no rope to get down. 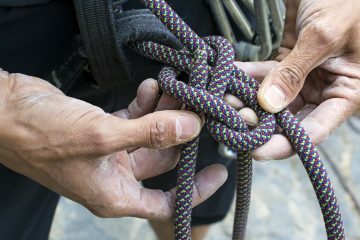 Most climbers do this by pulling up a few meters of slack, and then clove-hitching the rope to a quickdraw on their harness. When you’re certain that you’re secure, untie the rope from your harness, thread it through both rings or bottom chain links of the two anchor points and then re-tie the rope back through the waist and leg loops of your harness – as if you were about to start climbing again. Except for your PAS, you can now clean any gear – including quickdraws, slings, and carabiners – from the anchor points. Also, release the rope that you clove-hitched to your harness. When you’re ready to be lowered, call “TAKE” to your belayer. The rope should come tight through the anchor points. You can test it by taking some weight off of the PAS and seeing if the rope takes your weight. Only when you’re absolutely positive that your belayer is holding your weight, clean your PAS and remaining carabiners from the anchor and call “READY TO LOWER”, so your belayer can lower you. You should leave the anchor as you found it – with two points of safety and no other gear. If you need to clean the quickdraws off the bolts on the sport climb, you may want to clip a quickdraw to the belay loop of your harness, and clip the quickdraw’s other carabiner to the side of the rope that is running through the other quickdraws. This will keep you close to the line of bolts as you are lowered, so you can reach them more easily. Remember to unclip the quickdraw from the rope before you remove the final quickdraw (the one closest to the ground). If you don’t, you could potentially pull your belayer off balance as you clean the last quickdraw. Once back on the ground, pull the rope down from the anchor, and move on to your next route.